fall decorations around my home. The leaf plates are my favorite. I love the colors. 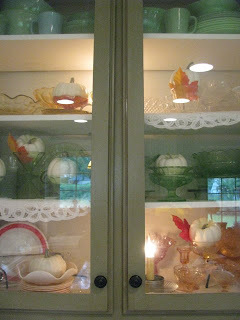 More beautiful vignettes in your home....love the white pumpkins and the leaf plates. Hi Joy! Those are some wonderful displays! I have some colorful leaf dishes too. I didn't even think about using them in my fall decorating. I've really got to get some white pumpkins! the leaf plates are super displayed like that! 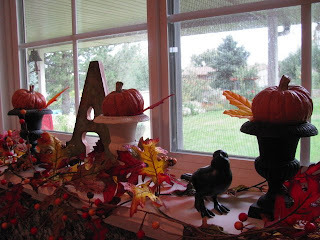 I love the pop of color and the rest of your fall decor is pretty terrific too! Looks greats! Love the leaf plates too. Cute cute cute, especially the leaves. I think I'd leave those out all year, so pretty! Love the shelf with the ceramic leaves! They display their color so nicely there. Beautiful as always. I'm still in search of the urns for my pumpkins. No one seems to have them. Love the leaf plates. Great idea. Beautiful! Slowly but surely I'm getting my act together and getting things decorated too. Problem is that I don't have alot of things for the fall...I have a gazillion things for Halloween but I think it's a little to early for the Halloween goodies. I love your plate rack. 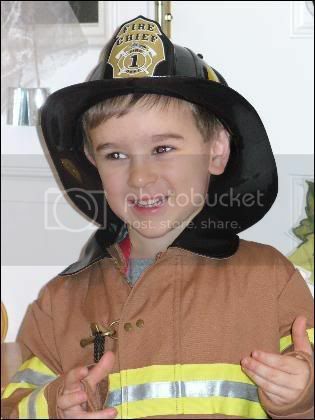 I've been on the lookout for one pretty much like yours. I did see one on-line but now I can't decide about the color...white or black. I'm leaving towards the black though. I love the glimpses of fall throughout your home. Especially the white pumpkins! Looking very pretty Miss joy! I love your glassware!!!!! Did you paint your pumpkins white or did you find them already like that? I for the life of me can't find a decent fake pumpkin. I'm thinking I may just have to wait for the real thing! I love the leaf plates they are great! I love those white pumpkins. It makes me feel that I should simplify more. Those leaf plates are great! I have a major weakness for dishes. Have way more than I will ever use, but I love them all! SEE!!! Now thats how a true FALL DIVA decorates...you just proved the point of my last post!!! It all looks beautiful! 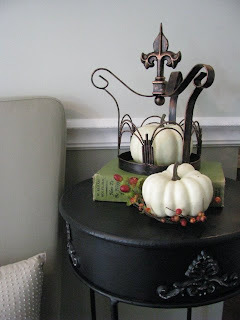 Very pretty vignettes and white pumpkins are my favorite! 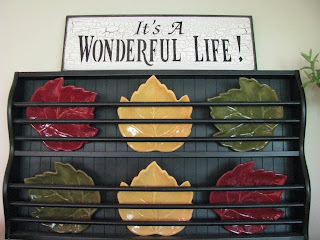 Love those leaf plates...Love all the decor...I need you to come do my fall stuff...looks so good Joy! All of your fall decor is gorgeous! I love your blog. Love all of it! So pretty! I had "lost" your blog for a while. Just added it to my blog roll- I'm so happy to be back- I have a lot of catching up to do! Expect a ton of comments now! I love your mantle! Can you tell me where you found the sweet little candle lights? LOVE THEM! You have an utterly amazing collection of goodies don't you! Love it all! Of course I love it all!! So pretty! Love your ideas. If I wasn't 10 days away from my wedding I'd start filling my house with fall decor. Come to think of it, it is full of fall decor, it's waiting to go to the wedding site. After the wedding I will have tons of stuff to repurpose for the house. Thanks for sharing your creativity. Your fall decor is coming together nicely as always. I'm still leaning towards green for my desk, but I have a few more projects to finish before I tackle it. I can't find the right shade of green spray paint that has a satin finish. I'll keep looking, but I may have to to it with regular paint. More beautiful vignettes, you are great with the details. Love the white punpkins. I love all these pics, but especially the giant acorns and the white pumpkins in the crown! 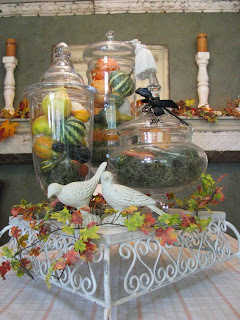 Love the white pumpkins and the apothecary jars with the gourds are lovely! I love your header picture!! The other decorations look so nice too. Don't you just love the colors this time of year? This is my absolute favorite time of year! Fabulous as usual! Lincoln & Ruby Jane's 1st birthday is next week and I'm doing a garden theme for their party. This give me lots of ideas. Thanks!